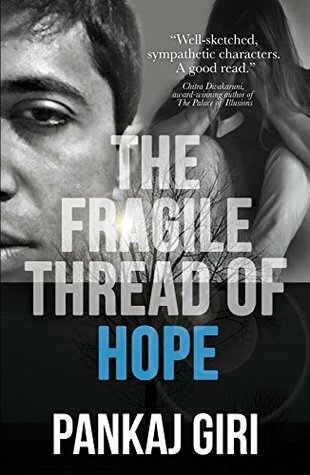 The Fragile Thread of Hope is Pankaj Giri's debut book. It's a contemporary fiction. The main characters of this book are Fiona and Soham. The story revolves around their family and love life. Both felt the loss of their loved ones at a very young age and this tragedy continues in future. Soham and Fiona are very different but their pain brings them close to each other. Soham is an engineer worked in Bangalore while Fiona is a school teacher. They have fears and tragic past memories which made them think that they didn't deserve to be happy. They lost the purpose of their life. But later they overcame with the help of each other. The plot based on Gangtok. The story is slow paced. The author described characters and events in detail which is unnecessary and made the story boring. I felt the pain of the characters. It's been an emotional roller coaster ride for me. The characters grow slowly. I like Fiona's mother Sharon character. She is a strong woman. The main character Soham and Fiona are a little dull maybe because of their past. The author can do much better with these two characters. The writing and vocabulary are good. But there are a few words which I don't like especially the word Nani. It's a self-published book. I really appreciate the author's writing and effort he put in this story. It's heart melting story and a piece of art. This book tells that never gives up and never loses hope. I recommend this to all. Seasoned with the flavors of exotic Nepalese traditions and set in the picturesque Indian hill station, Gangtok, The Fragile Thread of Hope explores the themes of spirituality, faith, alcoholism, love, and guilt while navigating the complex maze of family relationships. Well described ! !...awesome review ! !